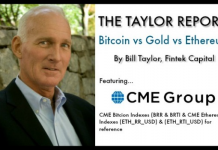 Home The Taylor Report-Bitcoin vs Gold vs Ethereum SEC Says ‘NO’ to Bitcoin ETF. Wild Ride After Announcement. SEC Says ‘NO’ to Bitcoin ETF. Wild Ride After Announcement. SEC rejects bitcoin ETF citing lack of regulation. Exchanges have no regulations in place to enforce any surveillance violations. Exchanges can’t regulate a product that doesn’t exist either. Bitcoin price drops to low of $1025 after announcement………….lower then my buying range of $1100-$1150. Oops, my bad. Still believe the dip should be bought. Short term trades; Buy $1050-$1100, upside short term target still $1300-$1350. Previous articleFriday’s NFP Important? Forget About It.